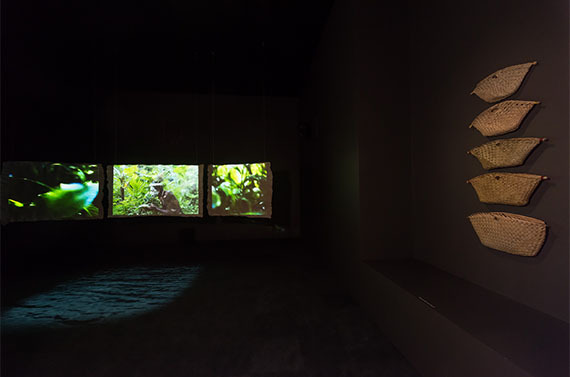 The a Bit na Ta project within ‘No.1 Neighbour: Art in Papua New Guinea 1966–2016’ is about a ples (place) — Blanche Bay in East New Britain — as experienced by its local people, the Tolai, between 1875 and 1975. Commissioned specially for the exhibition and led by celebrated Australian musician, composer and music producer David Bridie, a Bit na Ta brings together Tolai historians, artists, musicians and community members to share their perspectives on the events that shaped this century in and around Blanche Bay. At times, this history intersects with major world events, including two devastating World Wars; it illuminates processes of colonisation and political self-determination; and it has recorded cataclysmic volcanic eruptions. Visitors to the installation certainly won’t find a dry, plotted timeline. 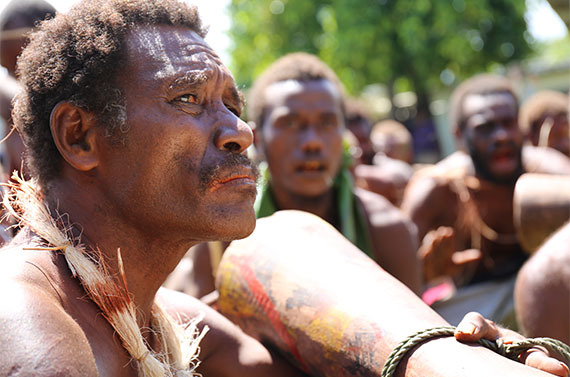 a Bit na Ta draws on the importance of music and song for the Tolai. Visitors to the installation will be immersed in a 30-minute sequence of songs and atmospheric sounds accompanied by five video projections. 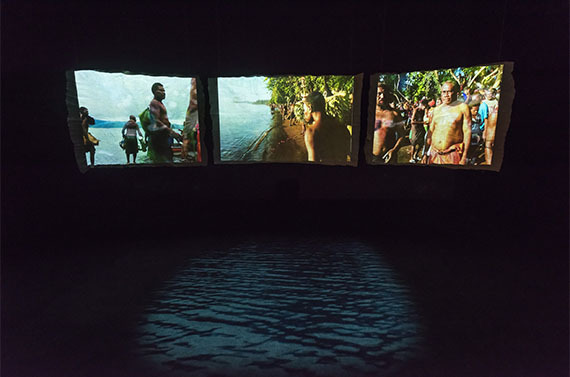 The centrepiece of the installation is the recording of a suite of new songs composed for the project by George Telek, arguably Papua New Guinea’s most famous practitioner. The haunting beauty of Telek’s voice, among characteristically Tolai three-part harmonies, captures the emotive power of key events in Tolai history. Together with Telek, there is a group of new songs by the Moab, Gilnata and Amidel stringbands. 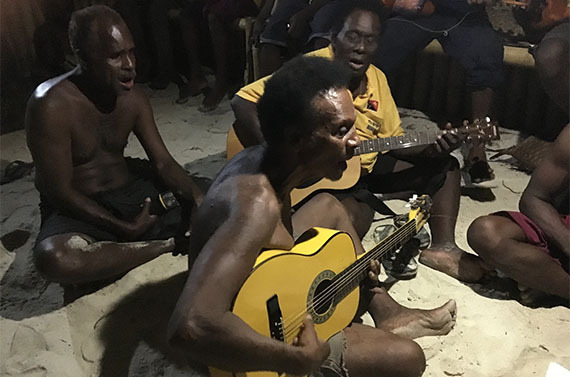 The Matupit choir and a group of older Tolai men and women also sing a range of customary songs that fully situate the project and history within a Tolai cultural sphere. 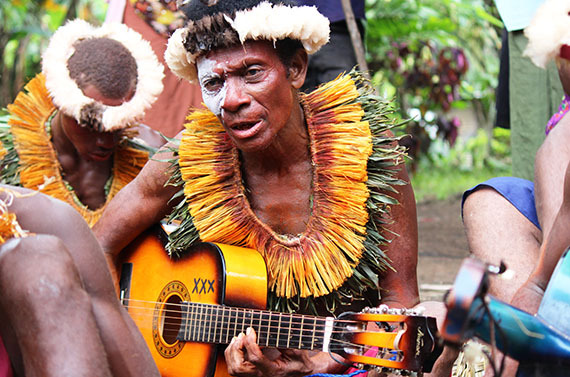 Across much of Oceania, music is not separated from life or other art forms. For a Bit na Ta, Melbourne-based artist Lisa Hilli and filmmaker Garett Low have collaborated with the project team to extend a rich aural experience into the visual and sensual realms. However, the bedrock of the project is the extensive cultural and historical knowledge held by Tolai historian Gideon Kakabin. 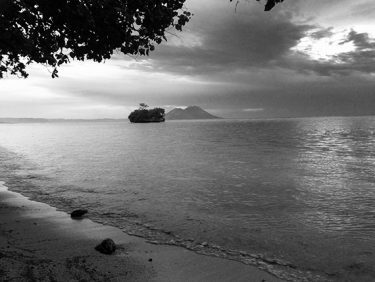 It is Gideon’s understanding of the intersection of history with Tolai life and experience that has shaped much of the content of a Bit na Ta. 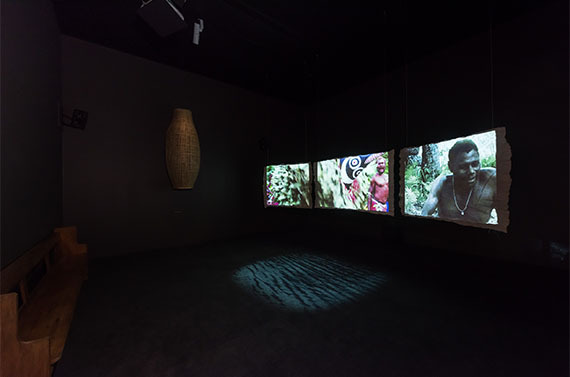 Within the broader ‘No.1 Neighbour’ exhibition, a Bit na Ta provides important insights into a period of history of Papua New Guinea in which Australia and Australians were heavily involved, for better and — as we will discover — for worse. It also celebrates the ongoing commitment that an individual Australian has made to developing and supporting creative conversations in this young nation. 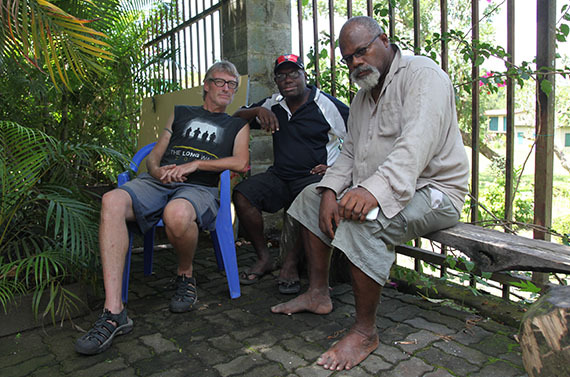 First travelling to Rabaul as part of the celebrated band Not Drowning Waving in 1986, David Bridie has since maintained a close relationship with Telek and his Tolai friends and family as well as championing the extraordinary music of the country through the Wantok Musik Foundation. 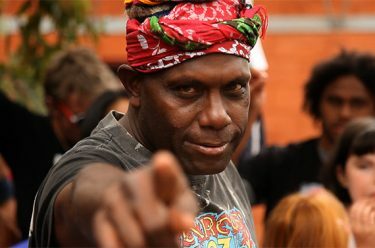 a Bit na Ta emerges from and is imbued with Bridie’s genuine and deeply felt respect for the Tolai people, and theirs for him. As such, the project is one of the centrepieces of the exhibition. 1 Gideon Kakabin, ‘a Bit na Ta’, in No.1 Neighbour: Art in Papua New Guinea 1966–2016 [exhibition catalogue], Queensland Art Gallery | Gallery of Modern Art, October 2016, p.60. 2 David Bridie, interviewed by Ruth McDougall in No.1 Neighbour, p.58. This is an extract from the Gallery’s Artlines magazine available from the Gallery Store. Keep up to date with the Gallery’s seasonal publication delivered each quarter to QAGOMA Members. A Bit na Ta. The source of the sea. Life begins here. a Bit Na Ta is supported by the Australian Government through the Australian Cultural Diplomacy Grants Program of the Department of Foreign Affairs and Trade. The exhibition continues until 29 January 2017. Our richly illustrated hardcover publication accompanies the exhibition, with contributions from Ruth McDougall, Tolai artist and historian Gideon Kakabin, Manus Island musician John Faunt, and commentators Kiri Chan and Ruth Choulai, as well as numerous artist interviews.